I came across a Pinterest post awhile back for new home owners, listing the things you should do when you move into a previously owned house. One of the things listed was to change out old rubber washer hoses with new stainless steel braided hoses. After doing some research, I’ve discovered several reasons for this. Washer hoses aren’t designed or meant to last forever, in fact washing machine manufacturers recommend hoses to be checked every six months and replaced every 3-5 years. Also, as rubber ages it loses flexibility, some water and chemical mixes may cause deterioration, sharp kinks or bends in the hose can weaken it, and manufacturing defects, and rust on the connectors, can increase the risk of bursting and flooding. Changing your washing machine hoses as recommended drastically reduces the risk for them to burst causing costly damage to your home. Turn off the water supply to the washer. Unplug the washer and pull it out so you have room to work. (It’s normal for it to be pretty dirty so don’t worry, it’s an excellent opportunity to clean.) You may need to disconnect the drain hose (that’s the fat one) but make sure to keep it raised up as it will have water in it. You may need to have someone hold it. Place the bucket beneath the remaining two hoses (these are thinner and are your hot and cold water hoses). Slash (cut) the hoses near their half way points and allow them to drain into the bucket. Once, they’ve finished draining, cut the hoses off the connectors. This keeps the hoses from getting in the way while you are removing the connectors. Remove the connectors from both the washer and the faucet. This should be fairly simple and only require the assistance of pliers or a wrench, however, if they are rusted this may be difficult. If the connectors are rusted try spraying them with WD-40 or another kind of lubricant then allow it to soak in for 10-15 minutes. Then try using the wrench or pliers. If you are still unable to remove the connecter you may need to make a diagonal cut using a hacksaw (if you aren’t sure you want to do this contact a licensed plumber) being careful not to cut through the threaded area of the faucet (if you cut through you’ll need to replace the faucet). Using a screwdriver pry the cut part of the connector until you can get the pliers on it. Using the pliers pull back the connector until you can see the threads and then using more WD-40 you should be able to unscrew the connector the rest of the way off. Now that the old hoses and connectors have been removed you can install the new hoses. Place a little bit of plumber’s grease on the threads of the faucet, the connector, and on the rubber washer. Double check that the rubber washer is fully seated inside the connector. Attach the connecter onto the faucet fully and hand tighten. Using the pliers do an additional 2/3 turn to ensure that the connection is secure but make sure to avoid over-tightening. Complete all connections using instructions 8-11 making sure not to kink or twist the hoses. Check for leaks by turning the water on slowly and retighten connections as needed. 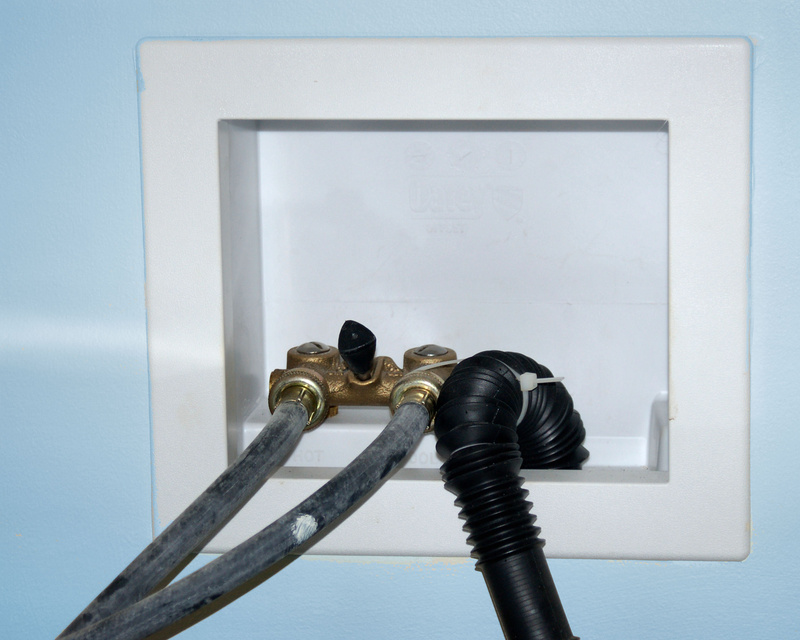 If you removed the drain line, reattach it and move the washer back into place, leaving 3-4 inches between the back of the washing machine and the wall if possible. 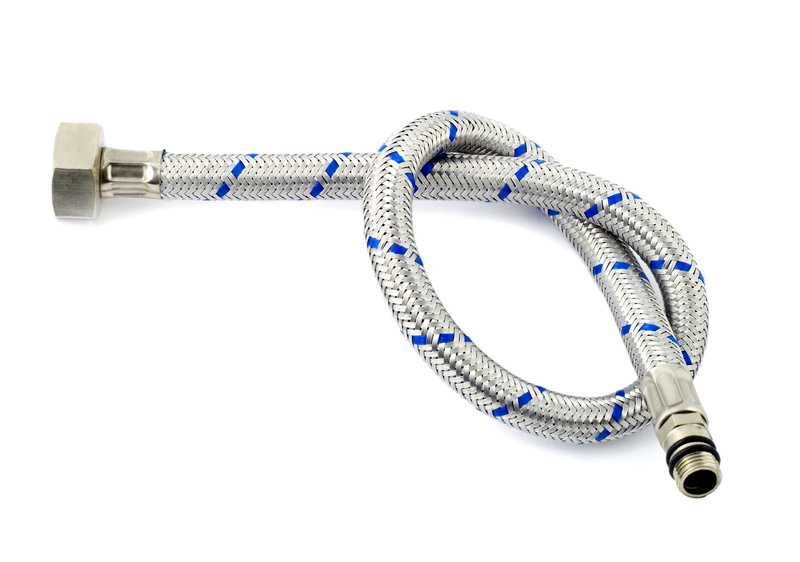 We recommend installing stainless steel braided hoses. They are a little more expensive but are less likely to burst. Color coded hoses simplify installation. Some come with blue and red markings already on them, but electrical tape or different colored rubber bands work just as well. If space is limited consider hoses that have elbow connectors, this alleviates the tension on the hose. If possible leave 3 to 4 inches between the machine and the wall to avoid kinks and sharp bends in the hose. Using a sharpie or white out pen write the installation date on the hoses (this will let you know when it’s getting close to time to change them again). If you don’t already have one, consider installing a lever style shutoff valve for easy operation between uses. If you are very worried about flooding, consider installing a washing machine leak detector kit, if it detects a leak, it will sound an alarm, and automatically turn off the water supply to the washing machine to prevent further damage. Washing machine hoses are available at most hardware stores and online. To avoid burst lines and flooding, only run the washer when someone is home. I’ve also seen suggestions of turning off the water supply valves (if it’s easy to reach) in between washings or if you are going out of town. Every six months check for cracks, kinks, blisters, or leaks in the hose. Replace hoses every 3-5 years, or if it helps you remember, every leap year. 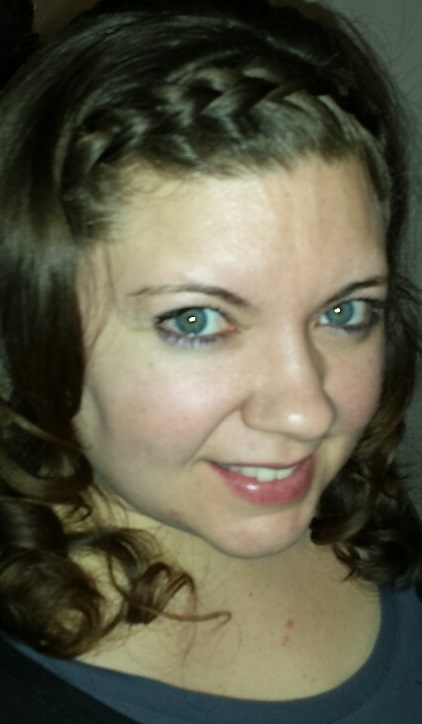 If you need help, contact a licensed plumber for assistance. A little preventative maintenance goes a long way in saving money, time, and ensuring peace of mind. Do you know of other often overlooked home maintenance tasks that we should blog about? Please comment below.